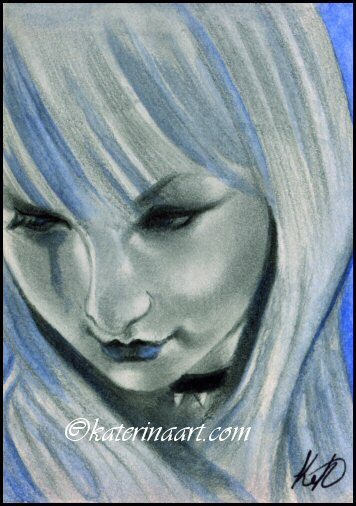 completed with watercolor and graphite on 2.5 x 3.5 (ACEO) bristol board. Jenny Heidewald says: You are really rockin' those colors! I love the blue highlights in her hair. :)	~ Reply? Kate says: Beautiful and moody. ~ Reply? Noreen says: So watching my back with her around.. Loving all of your work! ~ Reply? katerina Koukiotis says: thank YOU Jenny,kate,Norren so much xoxox	~ Reply? Kerrie Rusk says: Ooo. She looks so appropriately cold. ~ Reply? katerina Koukiotis says: thanks kerrie xoxo ~ Reply?